Bronx Lab School developed a series of Senior Seminars to allow students to choose an area of study that not only was of personal interest to them but allowed them in depth inquiry over the course of a year. 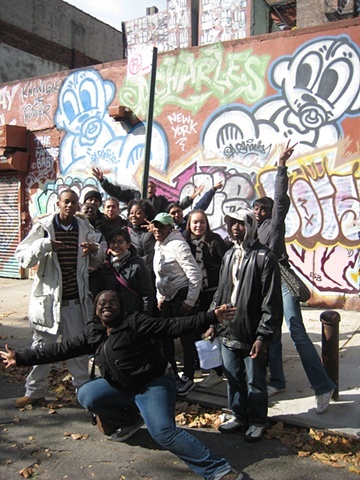 Students that chose the Public Art Senior Seminar spent the first part of the year exploring the concept of Public Art around the world and especially in New York City. Students had the opportunity to make connections with the art and ideas they learned by making many small forms of their own public art including: sketches for community spaces, stickers and stencils, place-based installations, and print posters. Each year the class culminated in the planning and installation of a large scale mural within the school conceived and executed by the students.